Very Good. 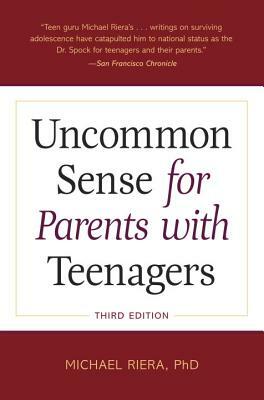 Uncommon Sense for Parents with Teenagers by Riera, Michael, 1995-04-30. Trade paperback (US). Glued binding. 222 p.
Very Good. 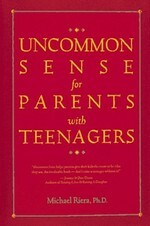 Uncommon Sense for Parents with Teenagers by Riera, Michael, 2004-10-04. Trade paperback (US). Glued binding. 240 p. Contains: Illustrations. This is a used book in good condition and may show some signs of use or wear. This is a used book in good condition and may show some signs of use or wear. Books by Michael Riera, Ph.D.
"A must read" for ANY parent with teenagers ,or you might want to start earlier to prepare. Inside you will find guidelines that will make it all clear and scenarios provided sound like someone has been watching you and your child in the Living Room! You will be in charge without them even realizing it, not by using tricks, but by thinking the same way they do, and offering answers that make sense to them. Get out your highlighter to mark parts that don't necessarily apply now--but will sooner or later and take the stress out of parenting!